I have not received any National Security Letter. Please join the Electronic Frontier Foundation ( EFF.org ) and the fight for your rights on the Internet. Please join the Union of Concerned Scientists ( uscusa.org ) in bringing science into improving all our lives (everyone is welcome to join). Public Domain works are a vital part of any culture and there are repeated attempts to erode the Public Domain. For more information see the Center for the Study of the Public Domain at Duke University. For some years I have been using 13x5.5 Panasport wheels. The tires have been 185/60x13 front and 205/60x13 rear. I was using Toyo RA-1 and when those got hard to find I switched to Toyo r888. I always have half the tread shaved off when I buy these track tires. They work well enough for me and I replace them based on age since they never seem to wear out. As of March 2012 I acquired some Rota 15x7 wheels and I have installed r888 in size 206/50x15 on a pair of the wheels as alternate rear wheels. This width wheel is a better fit for the tire width than the 5.5 inch wheels. The front wheels remain the Panasports. They have a 5 inch backspace and I used a 0.25 inch spacer outboard of the hat (just as I do on the 13 inch wheels). There is no interference with the body or radious arm. The 13 inch rears nominal wheel overall diameter is 22.6 inches. The 15 inch rears nominal wheel overall diameter is 23 inches, so that's essentially identical. The tread width is 7.8 inch with 13 inch wheels and 8.0 with 15 inch wheels, so that too is essentially identical. A 13 inch rear wheel and tire weigh 32 pounds and a 15 inch wheel and tire weigh 35 pounds. The question is whether the more stable platform of the wider wheel makes up for the extra weight. I'll be investigating that at Mazda Raceway Laguna Seca in April 2012. 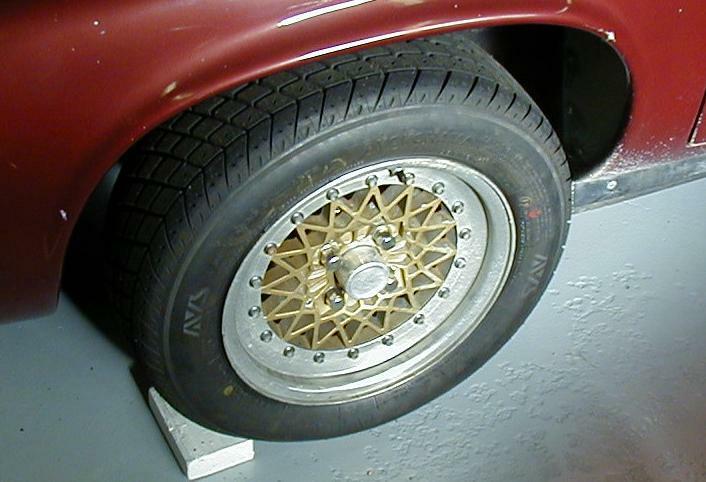 The Rota wheels look very much like the Panasports, here is the left rear. 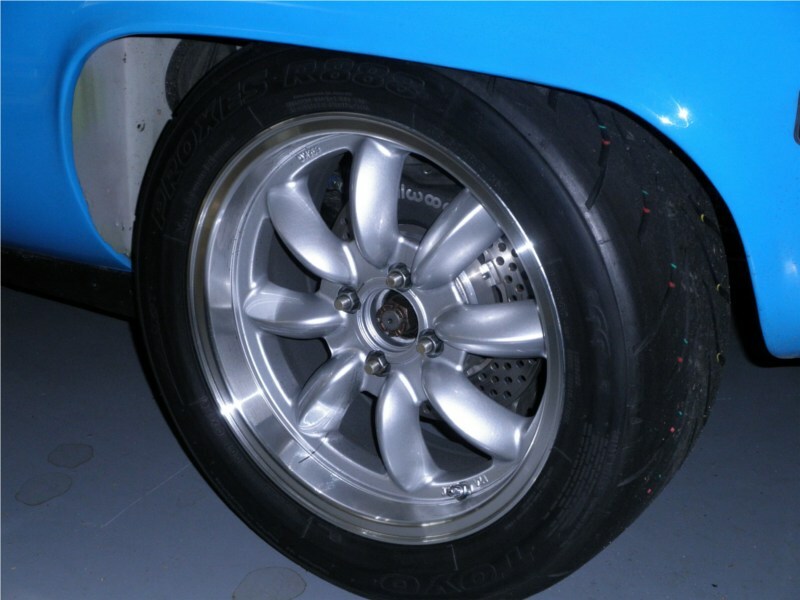 As purchased the car had Compomotive wheels. These 13x6 3 piece wheels eventually leaked air and the leak repairs (by a shop that specialized in Compomotive) were unsatisfactory, so I trashed them.